Nicolas Dandrimont and Sylvestre Ledru retired from the admin role after GSoC 2016 and Tom Marble has retired from the Outreachy administration role, we should be enormously grateful for the effort they have put in as these are very demanding roles. When the last remaining member of the admin team, Molly, asked for people to step in for 2018, knowing the huge effort involved, I offered to help out on a very temporary basis. We drafted a new delegation but didn't seek to have it ratified until the team evolves. We started 2018 with Molly, Jaminy, Alex and myself. The role needs at least one new volunteer with strong mentoring experience for 2019. Students start sending inquiries to some mentors well before GSoC starts. When Google publishes the list of organizations to participate (that was on 12 February this year), the number of inquiries increases dramatically, in the form of personal emails to the mentors, inquiries on the debian-outreach mailing list, the IRC channel and many project-specific mailing lists and IRC channels. Over 300 students contacted me personally or through the mailing list during the application phase (between 12 February and 27 March). This is a huge number and makes it impossible to engage in a dialogue with every student. In the last years where I have mentored, 2016 and 2018, I've personally put a bigger effort into engaging other mentors during this phase and introducing them to some of the students who already made a good first impression. As an example, Jacob Adams first inquired about my PKI/PGP Clean Room idea back in January. I was really excited about his proposals but I knew I simply didn't have the time to mentor him personally, so I added his blog to Planet Debian and suggested he put out a call for help. One mentor, Daniele Nicolodi replied to that and I also introduced him to Thomas Levine. They both generously volunteered and together with Jacob, ensured a successful project. While I originally started the clean room, they deserve all the credit for the enhancements in 2018 and this emphasizes the importance of those introductions made during the early stages of GSoC. In fact, there were half a dozen similar cases this year where I have interacted with a really promising student and referred them to the mentor(s) who appeared optimal for their profile. After my recent travels in the Balkans, a number of people from Albania and Kosovo expressed an interest in GSoC and Outreachy. The students from Kosovo found that their country was not listed in the application form but the Google team very promptly added it, allowing them to apply for GSoC for the first time. Kosovo still can't participate in the Olympics or the World Cup, but they can compete in GSoC now. At this stage, I was still uncertain if I would mentor any project myself in 2018 or only help with the admin role, which I had only agreed to do on a very temporary basis until the team evolves. Nonetheless, the day before student applications formally opened (12 March) and after looking at the interest areas of students who had already made contact, I decided to go ahead mentoring a single project, the wizard for new students and contributors. The application deadline closed on 27 March. At this time, Debian had 102 applications, an increase over the 75 applications from 2016. Five applicants were female, including three from Kosovo. One challenge we've started to see is that since Google reduced the stipend for GSoC, Outreachy appears to pay more in many countries. Some women put more effort into an Outreachy application or don't apply for GSoC at all, even though there are far more places available in GSoC each year. GSoC typically takes over 1,000 interns in each round while Outreachy can only accept approximately 50. Applicants are not evenly distributed across all projects. Some mentors/projects only receive one applicant and then mentors simply have to decide if they will accept the applicant or cancel the project. Other mentors receive ten or more complete applications and have to spend time studying them, comparing them and deciding on the best way to rank them and make a decision. Given the large number of project ideas in Debian, we found that the Google portal didn't allow us to use enough category names to distinguish them all. We contacted the Google team about this and they very quickly increased the number of categories we could use, this made it much easier to tag the large number of applications so that each mentor could filter the list and only see their own applicants. The project I mentored personally, a wizard for helping new students get started, attracted interest from 3 other co-mentors and 10 student applications. 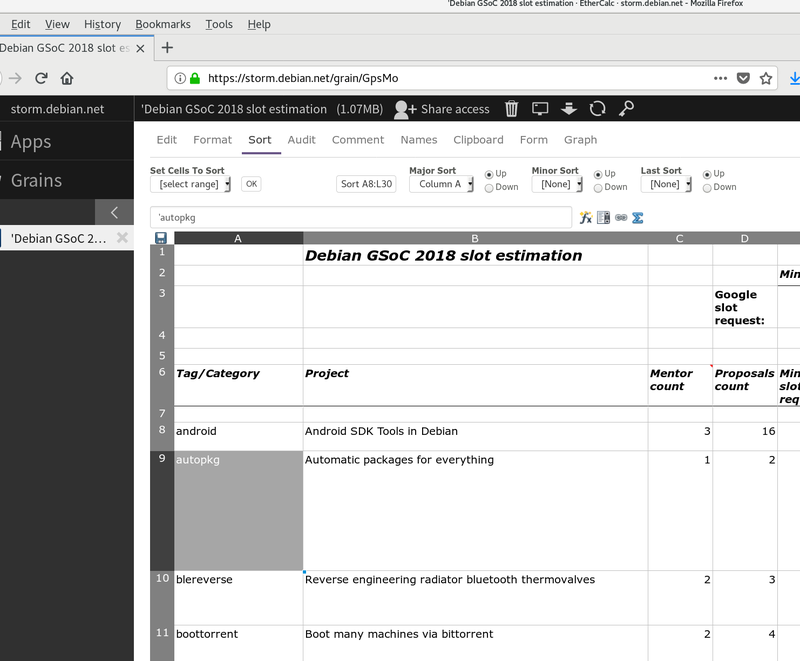 To help us compare the applications and share data we gathered from the students, we set up a shared spreadsheet using Debian's Sandstorm instance and Ethercalc. Thanks to Asheesh and Laura for setting up and maintaining this great service. Switching from the mentor hat to the admin hat, we had to coordinate the requests from each mentor to calculate the total number of slots we wanted Google to fund for Debian's mentors. Once again, Debian's Sandstorm instance, running Ethercalc, came to the rescue. All mentors were granted access, reducing the effort for the admins and allowing a distributed, collective process of decision making. This ensured mentors could see that their slot requests were being counted correctly but it means far more than that too. Mentors put in a lot of effort to bring their projects to this stage and it is important for them to understand any contention for funding and make a group decision about which projects to prioritize if Google doesn't agree to fund all the slots. Various topics were discussed by the team at the beginning of GSoC. One discussion was about the definition of "team". Should the new delegation follow the existing pattern, reserving the word "team" for the admins, or should we move to the convention followed by the DebConf team, where the word "team" encompasses a broader group of the volunteers? A draft delegation text was prepared but we haven't asked for it to be ratified, this is a pending task for the 2019 team (more on that later). There was discussion about the choice of project management tools, keeping with Debian's philosophy of only using entirely free tools. We compared various options, including Redmine with the Agile (Kanban) plugin, Kanboard (as used by DebConf team), and more Sandstorm-hosted possibilities, such as Wekan and Scrumblr. Some people also suggested ideas for project management within their Git repository, for example, using Org-mode. There was discussion about whether it would be desirable for admins to run an instance of one of these tools to manage our own workflow and whether it would be useful to have all students use the same tool to ease admin supervision and reporting. Personally, I don't think all students need to use the same tool as long as they use tools that provide public read-only URLs, or even better, a machine-readable API allowing admins to aggregate data about progress. Admins set up a Git repository for admin and mentor files on Debian's new GitLab instance, Salsa. We tried to put in place a process to synchronize the mentor list on the wiki, the list of users granted team access in Salsa and the list of mentors maintained in the GSoC portal. This could be taken further by asking mentors and students to put a Moin Category tag on the bottom of their personal pages on the wiki, allowing indexes to be built automatically. On 23 April, the list of selected students was confirmed. Shortly afterward, a Debian blog appeared welcoming the students. 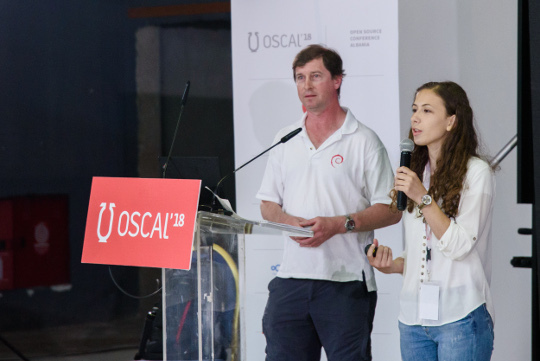 I traveled to Tirana, Albania for OSCAL'18 where I was joined by two of the Kosovan students selected by Debian. They helped run the Debian booth, comprising a demonstration of software defined radio from Debian Hams. Enkelena Haxhiu and I gave a talk together about communications technology. This was Enkelena's first talk. In the audience was Arjen Kamphuis, he was one of the last people to ask a question at the end. His recent disappearance is a disturbing mystery. 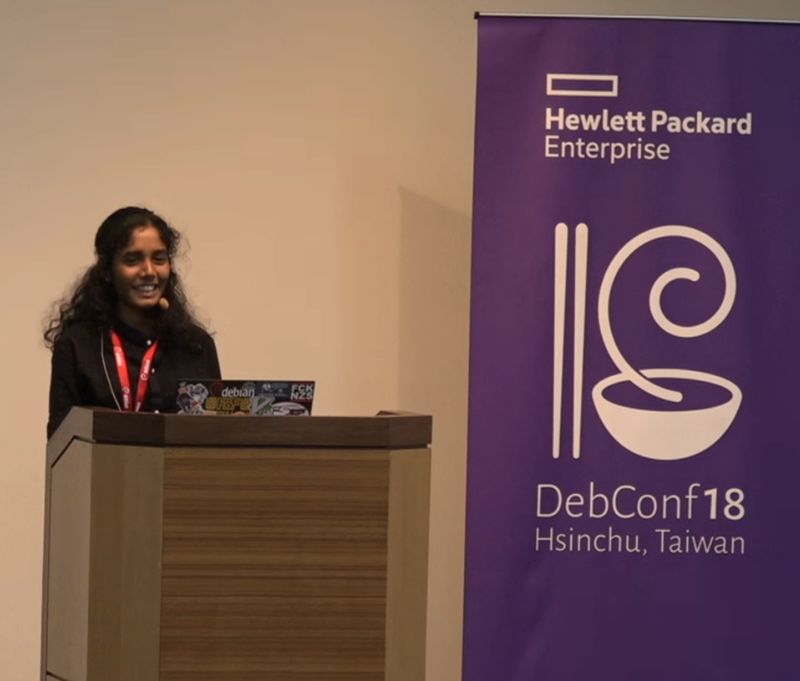 A GSoC session took place at DebConf18, the video is available here and includes talks from GSoC and Outreachy participants past and present. Many of the students have already been added to Planet Debian where they have blogged about what they did and what they learned in GSoC. More will appear in the near future. If you like their project, if you have ideas for an event where they could present it or if you simply live in the same region, please feel free to contact the students directly and help them continue their free software adventure with us. Google's application form for organizations like Debian asks us what we do to stay in contact with students after GSoC. Crossing multiple passes in the Swiss and Italian alps to find Sergio Alberti at Capo di Lago is probably one of the more exotic answers to that question. I first mentored students in GSoC 2013. Since then, I've been involved in mentoring a total of 12 students in GSoC and 3 interns in Outreachy as well as introducing many others to mentors and organizations. Several of them stay in touch and it's always interesting to hear about their successes as they progress in their careers and in their enjoyment of free software. 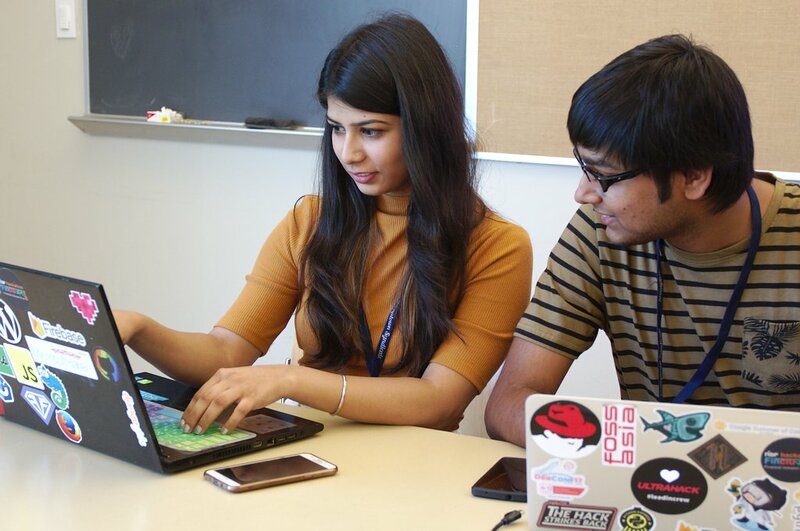 The Outreachy organizers have chosen a picture of two of my former interns, Urvika Gola (Outreachy 2016) and Pranav Jain (GSoC 2016) for the mentors page of their web site. This is quite fitting as both of them have remained engaged and become involved in the mentoring process. One of the big challenges we faced this year is that as the new admin team was only coming together for the first time, we didn't have any policies in place before mentors and students started putting significant effort in to their proposals. Potential mentors start to put in significant effort from February, when the list of participating organizations is usually announced by Google. Therefore, it seems like a good idea to make any policies clear to potential mentors before the end of January. We faced a similar challenge with selecting mentors to attend the GSoC mentor summit. While some ideas were discussed about the design of a selection process or algorithm, the admins fell back on the previous policy based on a random selection as mentors may have anticipated that policy was still in force when they signed up. As I mentioned already, there are several areas where GSoC and Outreachy are diverging, this already led to some unfortunate misunderstandings in both directions, for example, when people familiar with Outreachy rules have been unaware of GSoC differences and vice-versa and I'll confess to being one of several people who has been confused at least once. Mentors often focus on the projects and candidates and don't always notice the annual rule changes. Unfortunately, this requires involvement and patience from both the organizers and admins to guide the mentors through any differences at each step. One of the most contentious topics in Debian's GSoC 2018 program was the discussion of whether Debian can and should act as an umbrella organization for smaller projects who are unlikely to participate in GSoC in their own right. As an example, in 2016, four students were mentored by Savoir Faire Linux (SFL), makers of the Ring project, under the Debian umbrella. In 2017, Ring joined the GNU Project and they mentored students under the GNU Project umbrella organization. DebConf17 coincidentally took place in Montreal, Canada, not far from the SFL headquarters and SFL participated as a platinum sponsor. Google’s program administrators actually look quite fondly on the umbrella organizations that participate each year. For an organization like Debian, with our philosophy, independence from the cloud and distinct set of tools, such as the Salsa service mentioned earlier, being an umbrella organization gives us an opportunity to share the philosophy and working methods for mutual benefit while also giving encouragement to related projects that we use. Some people expressed concern that this may cut into resources for Debian-centric projects, but it appears that Google has not limited the number of additional places in the program for this purpose. This is one of the significant differences with Outreachy, where the number of places is limited by funding constraints. Therefore, if funding is not a constraint, I feel that the most important factor to evaluate when considering this issue is the size and capacity of the admin team. Google allows up to five people to be enrolled as admins and if enough experienced people volunteer, it can be easier for everybody whereas with only two admins, the minimum, it may not be feasible to act as an umbrella organization. Within the team, we observed various differences of opinion: for example some people were keen on the umbrella role while others preferred to restrict participation to Debian-centric projects. We have the same situation with Outreachy: some mentors and admins only want to do GSoC, while others only do Outreachy and there are others, like myself, who have supported both programs equally. In situations like this, nobody is right or wrong. Once that fundamental constraint, the size of the admin team, is considered, I personally feel that any related projects engaged on this basis can be evaluated for a wide range of synergies with the Debian community, including the people, their philosophy, the tools used and the extent to which their project will benefit Debian's developers and users. In other words, this doesn't mean any random project can ask to participate under the Debian umbrella but those who make the right moves may have a chance of doing so. Google pays each organization an allowance of USD 500 for each slot awarded to the organization, plus some additional funds related to travel. This generally corresponds to the number of quality candidates identified by the organization during the selection process, regardless of whether the candidate accepts an internship or not. Where more than one organization requests funding (a slot) for the same student, both organizations receive a bounty, we had at least one case like this in 2018. For 2018, Debian has received USD 17,200 from Google. Personally, as I indicated in January that I would only be able to do this on a temporary basis, I'm not going to participate as an admin in 2019 so it is a good time for other members of the community to think about the role. Each organization who wants to participate needs to propose a full list of admins to Google in January 2019, therefore, now is the time for potential admins to step forward, decide how they would like to work together as a team and work out the way to recruit mentors and projects. Thanks to all the other admins, mentors, the GSoC team at Google, the Outreachy organizers and members of the wider free software community who supported this initiative in 2018. I'd particularly like to thank all the students though, it is really exciting to work with people who are so open minded, patient and remain committed even when faced with unanticipated challenges and adversity.